I have just finished the first layer of underglazes on Bodyguard. 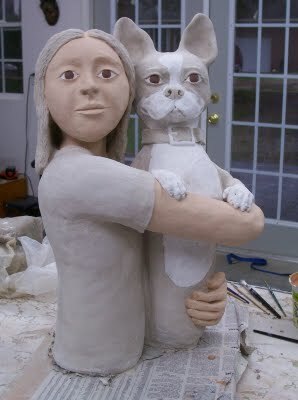 To avoid having to fire the piece too many times, I applied underglazes to the unfired work (greenware). Although my plan was to have a fair skinned girl with red hair and blue eyes, the more I looked at the sculpture, the more I felt the need to go in a different direction–brown haired girl with brown eyes. As you can see, the faces of girl and dog are at the same level, with facial features lined up. Also, the dog’s eyes are quite anthropomorphic. I wanted the eyes of both to be the same color. Although Boston terriers, like other dogs, can have blue eyes, I felt that might be a bit much. So the brown eyes work. Here is an early photo–I have more recent ones, but need to update my iPhoto. In the meantime, I wanted to get this entry posted. After firing, the girl’s skin will be a little darker. I’ll layer on more underglazes (in slightly different colors) and refire. Well, here’s something spooky–heard from my brother the other day, who had seen my earlier post (before any underglazes were applied) and said, “I see you in this piece.” That reminded me of when I was a Tween, had longer, straight hair and was thin–and, yes, there is quite a resemblance! So that may have been a subconscious influence on my hair and eye color choices. Growing up, we had only one dog, a cairn terrier mix my Uncle Gino rescued from the animal shelter. His name was Mickey, after a dog my father had in his childhood. Mickey and I were inseparable. Spoo-ky….